on the imac, there is no issue. the profile works on each os. Unable to open the summary file for Inbox. Perhaps there was an error on disk, or the full path is too long. I have even copied the profile from the imac to the laptop and the same message appears. what could be causing the error message? There were several bugs in 2.x and 3.x that caused that same error but they've been fixed for many years. I've seen some couple year old threads that claim what version of Linux you are using can cause that problem, but I don't have enough information to tell if that is true. Thunderbird really wasn't designed to support multiple instances running on different operating systems to share a profile (via a file share) at the same time. They don't even use the same name for the lock file. It's possible it used to work okay but a regression bug in 60. * was created, and it was missed due to your configuration not being a common use case. i hear you. but the same profile on another computer works. on debian sid both updated at around the same time. I found https://www.reddit.com/r/Thunderbird/co ... x_perhaps/ (same problem under Ubuntu) but it doesn't describe a workaround. Unfortunately I haven't used Linux for many years so I can't suggest how to figure out the significant differences between your two Linux systems. I searched the official support forum at https://support.mozilla.org/en-US/questions/thunderbird and couldn't spot anything related . There are always teething problems with new major releases. Have you considered dropping back to 52.9.1, while waiting for 60.1 to be released? You could keep your existing profile if you did that. oh didn't realise i had crossed a major release. will try going back. That is weird. 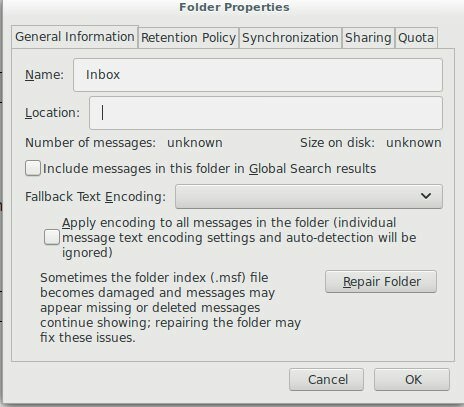 It also ignores the number of messages, the size of the folder and the fallback text encoding. I double checked that works with both mbox and maildir accounts under Windows. It would be interesting to see if the same problem occurs using a Mozilla Linux build rather than the distro build. don't get the error message - that is, it works.